Learn the skills you need to make a success of your journey. The CultureRoute 120-hour online TEFL course has all the key features that give you a great TEFL qualification. We provide the educational tools and cultural preparation to embark on a life changing adventure of growth and learning. The course begins with an introduction to the theory and history of teaching English as a foreign/second language. These theories will be emphasized throughout the course assignments. 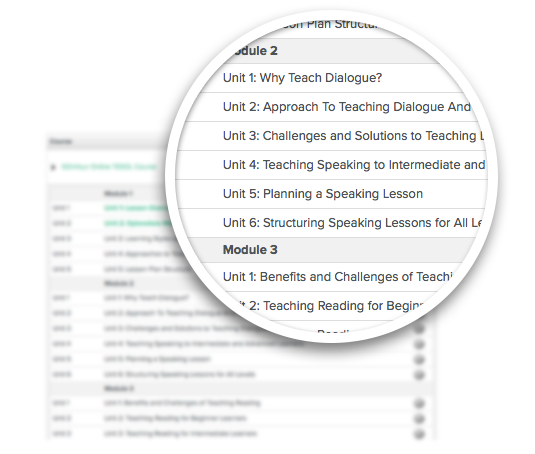 Each module incorporates practical training which introduces you to the different approaches used to teach speaking, reading and listening, along with strategies for classroom management. The course includes mandatory online lesson presentations, where an experienced instructor will review your teaching and provide feedback. You will have access to expert instructors as well as online resources for lesson plans and teaching methods. 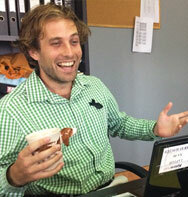 Meet Justin - CultureRoute’s video presenter who has 4+ years experience of teaching English in Thailand. He’ll be passing along tips he learned along the way and introducing you to each element of the course. 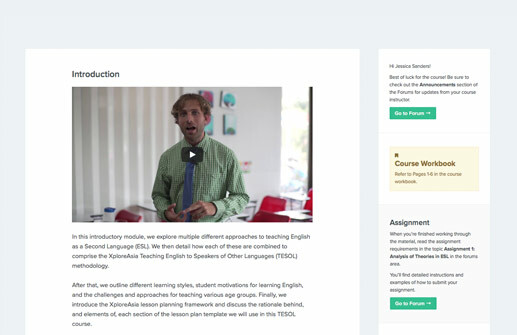 The video tutorials include footage of real classroom scenarios from Thailand, South Korea, Myanmar and Vietnam, and expert advice from Justin and other English teachers in the field. "The 120-Hour Online TEFL Course was incredibly helpful because it provided me with opportunities to create lesson plans and try new techniques. I also liked that we critiqued our fellow participants because we could learn from each other, both tips and ideas." If you love the idea of teaching English abroad but find the idea of standing up in front of a class quite nerve-wracking, the carefully structured, tried and tested CultureRoute TEFL course is just the thing to boost your confidence for the adventure ahead. Each module will prepare you for different aspects of the teaching experience and build up your skills to respond to every curveball the classroom might throw at you. The first module will introduce you to the different methods of teaching English and incorporate those methods into lesson plans. Key Takeaway: A repertoire of skills for dealing with different classroom environments and age groups, as well as tips for structuring a successful lesson. Being able to speak English is the most underdeveloped skill your ESL students have and one of the main reasons that native English speakers are so sought after by schools around the world. This module focuses on how to teach English to ESL learners of all ages and structuring lessons to improve students’ capability to speak English and just as importantly, to improve their confidence! Key Takeaway: Techniques, structures and tips for developing creative, engaging speaking lessons for students of all ages and skill levels. 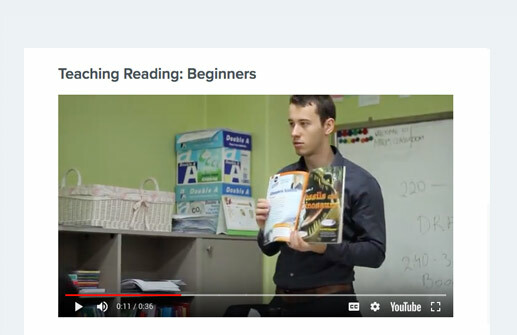 This module will introduce you to different techniques for teaching reading to students whose reading skills, concentration and interests may vary. Key Takeaway: Strategies, techniques, and creative pathways to developing reading lessons which draw on student interest and push out their language frontiers. With a focus on drawing on your own creativity, here’s your opportunity to share your interests with your students and learn about theirs. Listening is important for building confidence in speaking and practicing pronunciation. 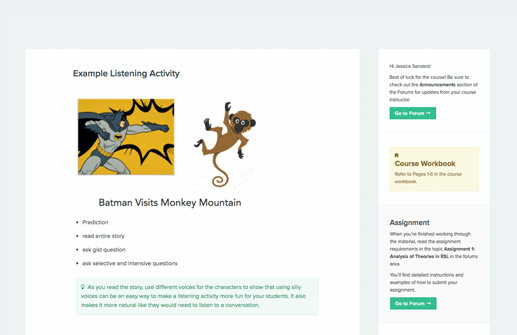 In this module, you’ll learn how to prepare a listening lesson for students which will help to improve their dialogue and comprehension. Key Takeaway: In-depth knowledge of the importance and techniques for teaching pronunciation as good listening skills will improve speaking, grammar and pronunciation. Schools will often expect you to focus on speaking more than grammar but the simple games and exercises suggested in this module will help you to introduce students to correct grammar in a fun way that will make it much easier for the teacher and students. Key Takeaway: Your students will pick up on your correct use of grammar whenever you speak to them. 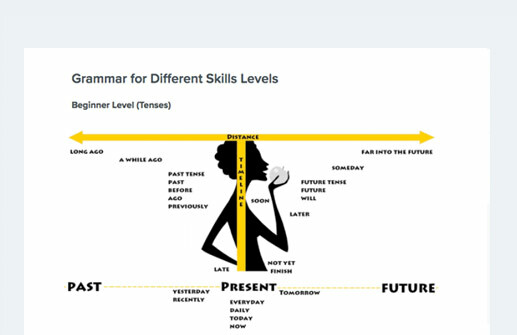 You can incorporate some grammar practice into other aspects of your teaching. Classroom management is routinely the most challenging aspect of teaching. It does take practice, but after learning about the key reasons why students misbehave and the best ways to respond, you will be on your way to creating a fun and balanced classroom environment. Key Takeaway: You’ll have to find your own style of classroom management, but having confidence, building trust with your students and not taking yourself too seriously are good places to start. Justin holds a Bachelors of Arts (B.A) in English-American Literature and Creative Writing from Central Washington University in the United States. After receiving his 120 hour TESOL certification, he taught high school English in Thailand for two years. Later, he acted as education manager, where he trained and certified over 600 new teachers in TEFL/TESOL, and constantly worked to create new education content for the local teacher and student communities. In 2018, Justin was the lead teacher at Homeschool Isla Mujeres in Mexico, where he taught core elementary subjects with a creative focus. 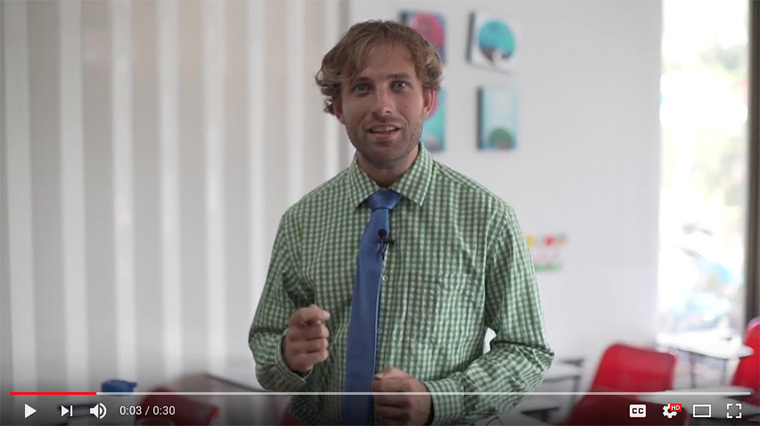 Justin currently teaches online TEFL/TESOL certification classes, and writes daily about education. He’s the perfect instructor to guide and encourage you as you begin your adventure as both traveller and educator. The course is 120 hours and has to be completed in 4 weeks. You will receive each module at the start of a new week and you will have clear instructions for when to submit weekly assignments. You will only have access to specific content each week so you won't be able to complete the course in a shorter possible time. This is to aid your learning and provide enough time to engage with your instructor and fellow students. Do I need to complete the TEFL course if I have a Bachelor's degree? Yes, you will be required to have a TEFL certificate to teach English abroad. In some cases, you will have to have a Bachelors degree as well, but we can assist you with exploring your options for job placement depending on your qualifications. Is an online course a recognised qualification for getting a job teaching English? Yes, it is a recognised qualification for teaching English to speakers of foreign languages. Some countries or schools prefer in-class TEFL, so if you already have a specific country or school in mind, make sure to double check. I’m not great at time management. Will I be able to succeed in this online course? Time management can be tough with any course. For the CultureRoute TEFL, you will receive each module at the start of a new week and you will have clear instructions for when to submit weekly assignments. Concentrate on the week’s work, follow the structure of the course and you should be just fine. Will the CultureRoute online TEFL/TEFL course guarantee me a job teaching English? The CultureRoute online TEFL course is internationally accredited. When you complete the course, you’ll receive a certificate and a personalised letter of recommendation, signed by your instructor. You will be well positioned to get a job with this qualification, however you will still have to find a job. We can assist you with pre-departure and ongoing support as you start your journey. How long will the online TEFL course be valid for? Your online TEFL course is valid for life. You may want to refresh your knowledge at some stage but your TEFL certificate will remain valid. What is the difference between TEFL, TEFL and CELTA? TEFL (Teaching English as a Foreign Language) and TEFL (Teaching English to Speakers of Other Languages) are different acronyms that refer to very similar courses in ESL (English as Second Language) teaching. Some courses are better than others and they might be branded differently, but the basics are the same. CELTA (Certificate in English Language Teaching to Adults) is a different brand of these courses which is specifically tailored to teaching English to adults. If you know for sure that you want to teach adults, then CELTA might be for you, but bear in mind that this might limit your options if you ever want to teach children. Which countries accept online TEFL/TEFL for teaching jobs via your placement? We offer assistance for placement in: Thailand, Vietnam, South Korea, Myanmar and China. More countries coming soon! I have a full time job. Will I manage to complete the course? The course takes 120 hours to complete, over 4 weeks. If you can spend 1 or 2 nights a week and a bit of time on the weekend on your TEFL course, you shouldn’t have problems completing the course alongside your job. Can anyone apply for the TEFL course? Yes, anyone can apply. Keep in mind that some countries require English teachers to have a Bachelors degree as well as a TEFL. Do I need to be an English teacher to do the course? No, anyone can do the course. Teaching English to speakers of other languages is a different skill to teaching English to home language speakers. What separates CultureRoute’s course from the others? CultureRoute courses are not automated. You will always be speaking to a person and your work will be marked by an experienced instructor who will give personalised feedback to each student. You will receive expert feedback on your work and excellent video tutorials. How do I find a job after the course? We offer job placement services, including all pre-departure and in-country support. No, all the course material will be provided when you sign up to the course. However, you will only receive the material one week at a time - you won’t be able to rush through the whole course in the first week. CultureRoute’s 120-hour Internationally Accredited online TESOL is the ideal first step to prepare you for your adventure.